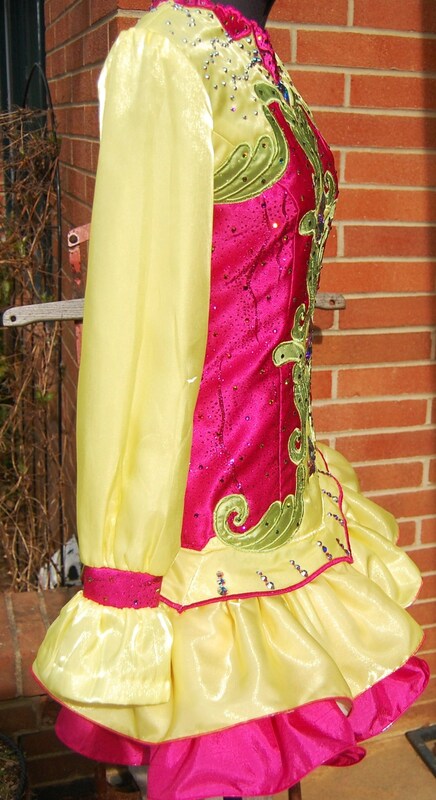 This dress has now sold! Price $1200 including shipping within the US. Overseas shipping is extra. Returns will be accepted as long as dress is back within 3 days and is in the same condition as it was when sent. Paypal is accepted and preferred. Payment must be received before dress is shipped. Here is another off the rack in sunny yellow! 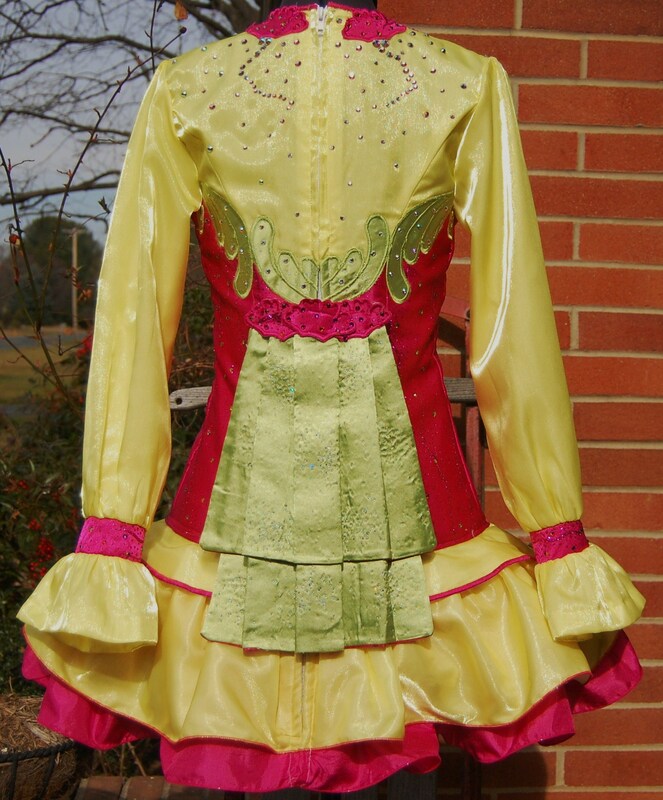 This stunning and elegant yellow and bright pink dress is brand new, current and will stand out on stage with its eye-catching bright colors. 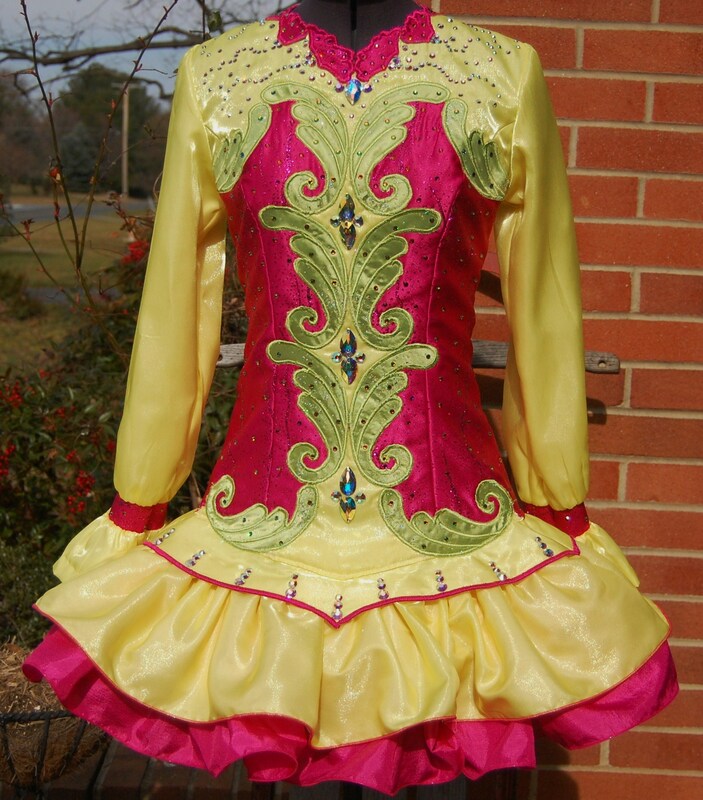 The bodice is made of a lemon yellow sparkle satin and bright fuchsia falling rain satin and accented with bright spring green swirl embroidery. 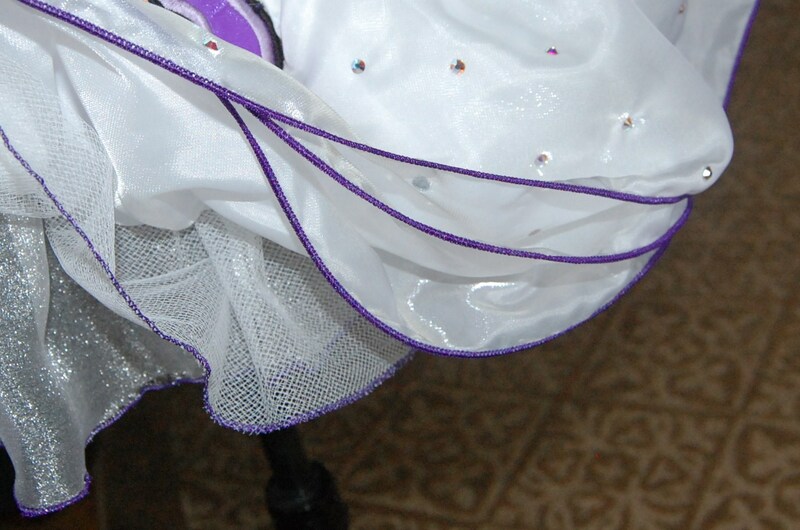 The skirt is made up of two layers and has a tulle underskirt for support. 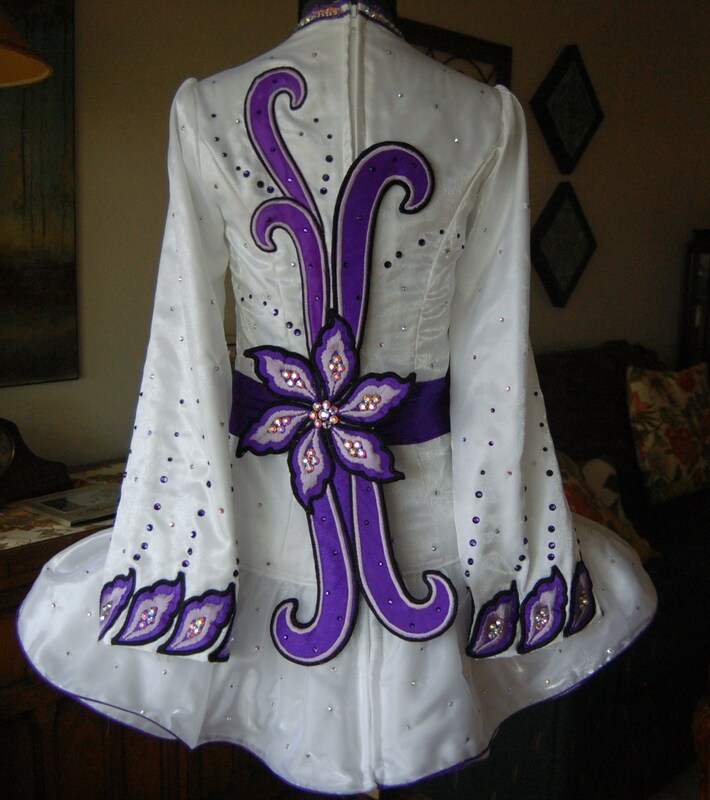 The entire dress is adorned with hundreds of Swarovski crystals in different colors and is accented with large teardrop crystals down the center. 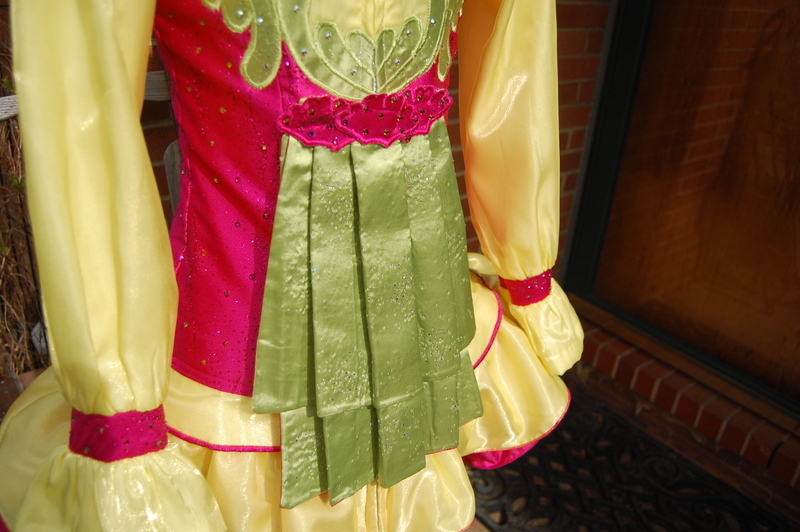 There is 3 inches of total let out in the bodice at the waist, hips and bust. The skirt can be let down another inch or it can be shortened easily. 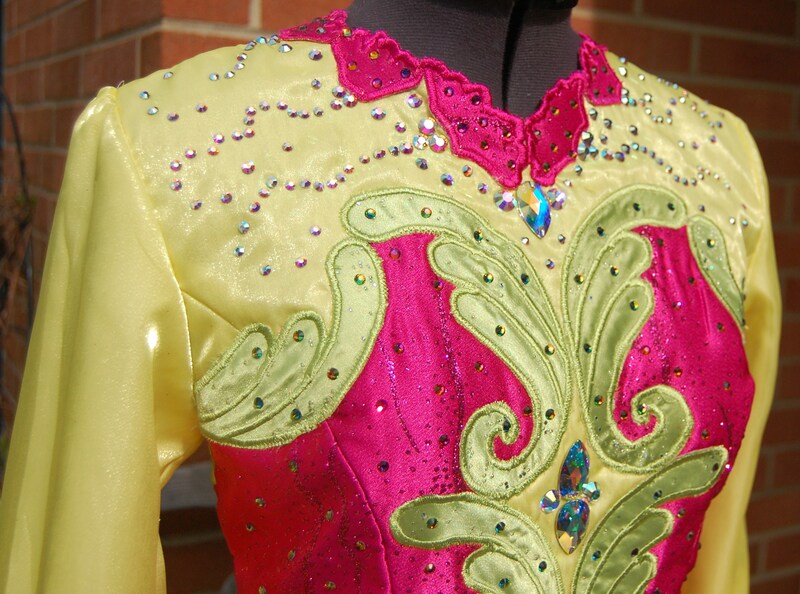 The dress comes with a covered headband of pink, green, or yellow depending on the buyer’s preference. Price $1450 including shipping in the US. 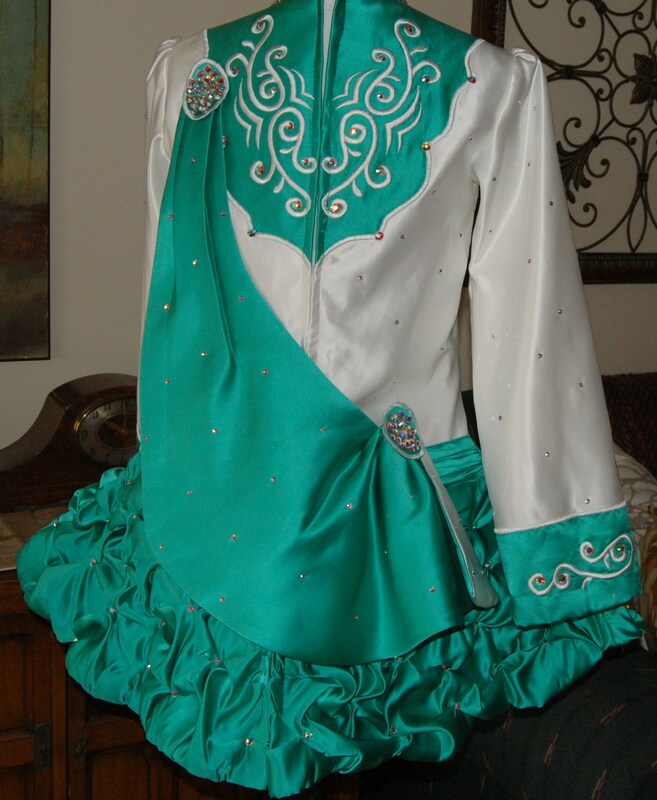 Minor alterations will be included in the price of the dress. Returns will be accepted as long as dress is back within 3 days and is in the same condition as it was when sent. Paypal is accepted and preferred. Payment must be received before dress is shipped. 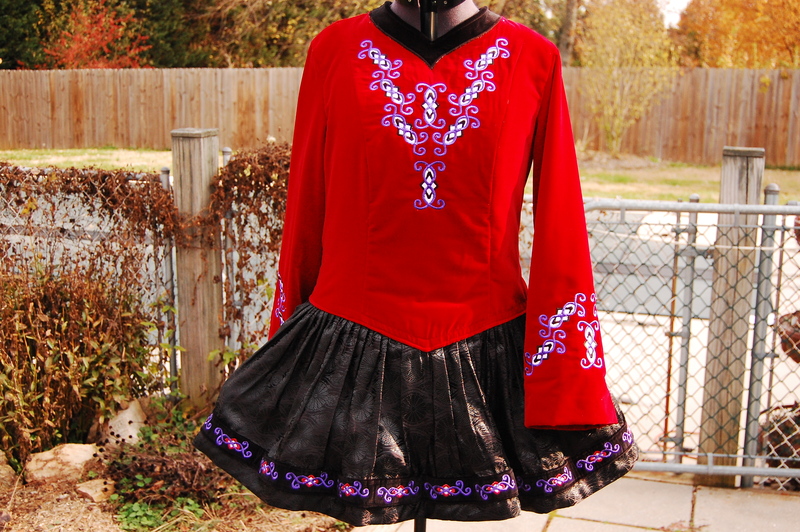 This bold red, black, and white dress is brand new and will stand out with its striking design made up of graduated Celtic knots. 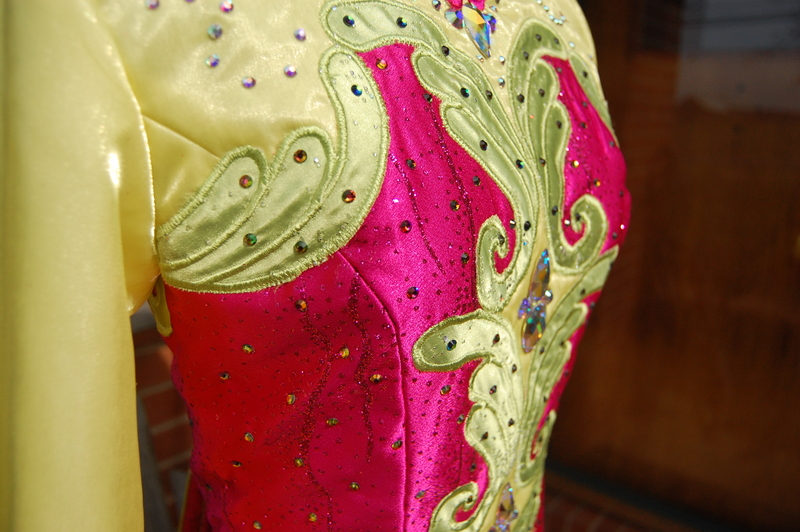 The bodice is made of a beautiful red sparkle satin with white sparkle satin accents. 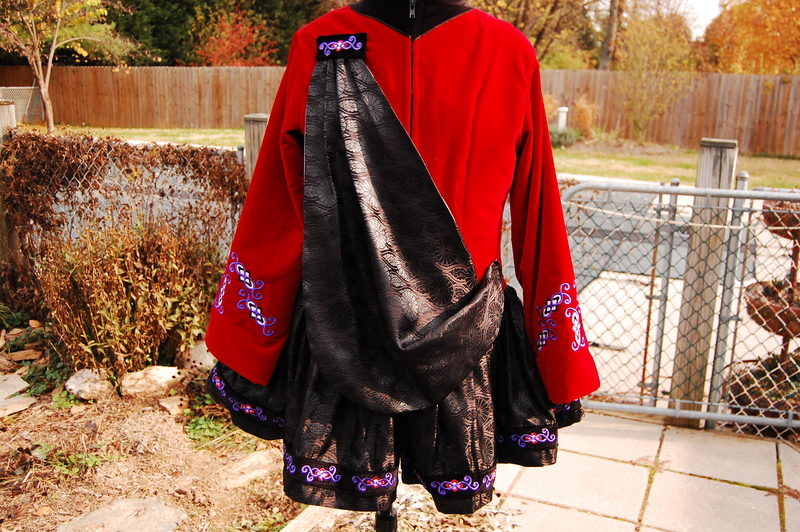 The skirt, one sleeve and shoulder are made of rich black sparkle velvet. 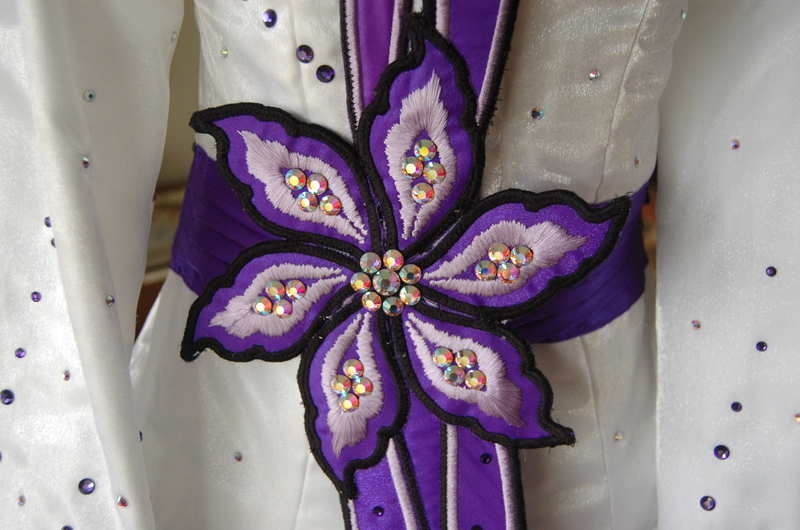 The entire dress is adorned with hundreds of Swarovski crystals and accented with large square crystals around the neck and waist. 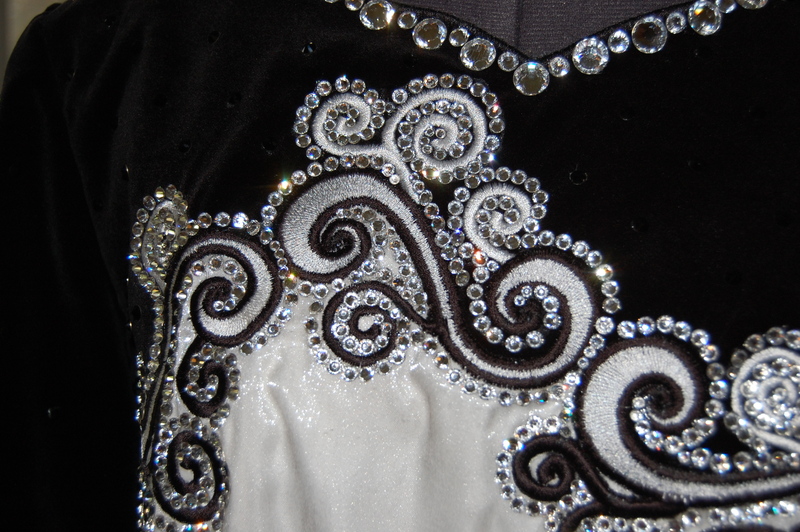 There is 3 inches of total let out in the bodice at the waist and bust. 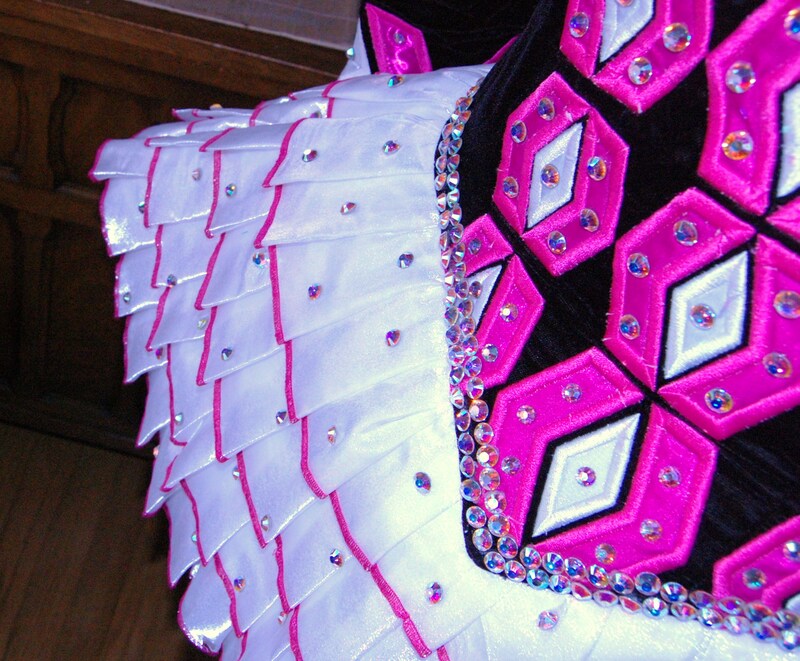 There is an inch of let out at the hips and the skirt can be let down another inch or it can be shortened easily. The underskirt of the dress is made up of layers of red organza, white organza, and a white sparkle organza. 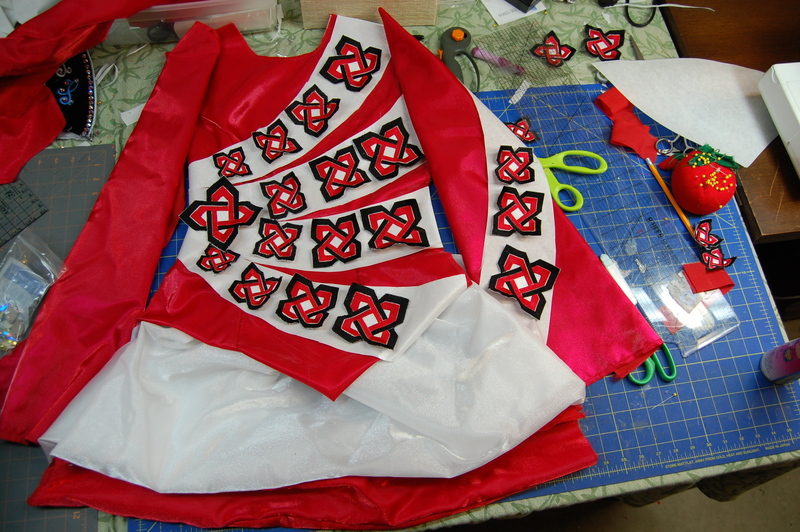 The dress comes with a covered headband of red, black, or white depending on the buyer’s preference. Price $1800 plus shipping. Returns will be accepted as long as dress is back within 3 days and is in the same condition as it was when sent. Paypal is accepted and preferred. Payment must be received before dress is shipped. Coming soon I will post an off the rack that I have been working on, but for now here is a glimpse of where I started with it. 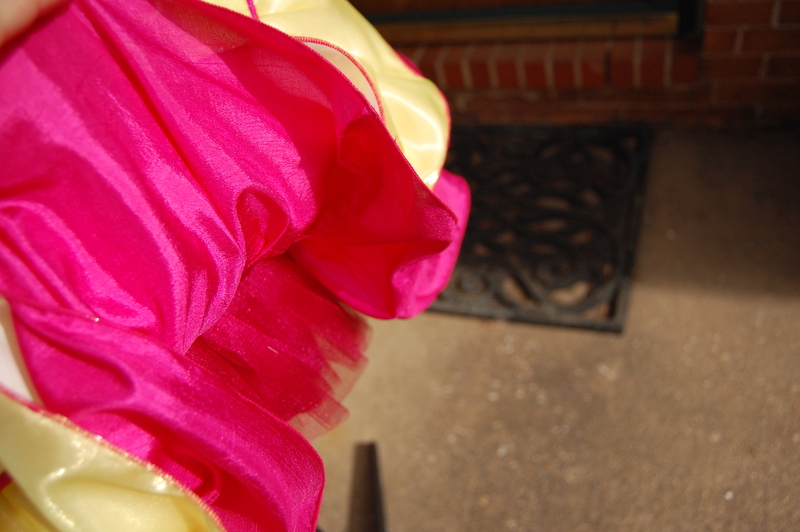 This dress is a totally different skirt style than anything I’ve made before. 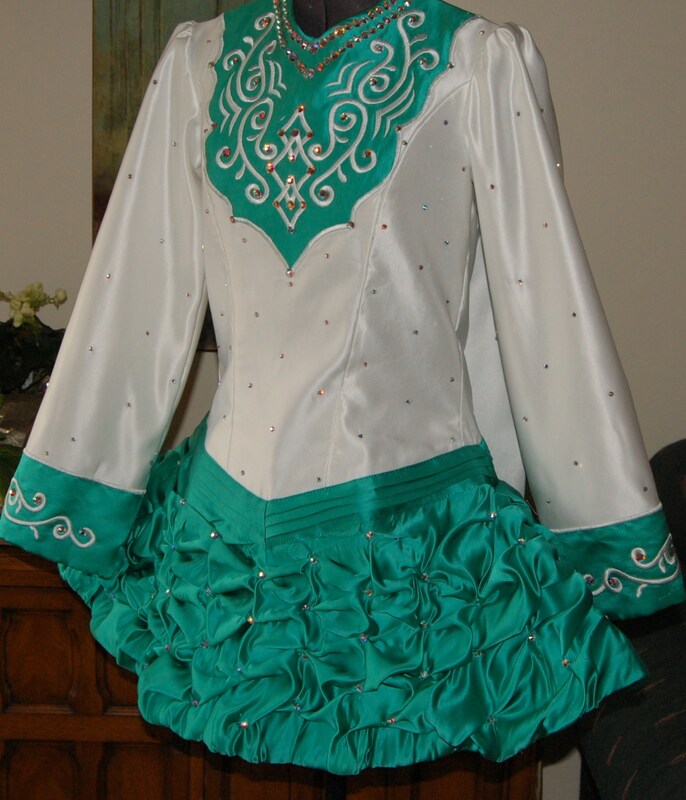 It was based on a pick-up style skirt seen at an Oireachtas and similar to a style seen on a lot of wedding dresses. The girl wearing this dress is a beautiful red head so the color is perfect on her. Here are a few of the dresses that I’ve made this year. 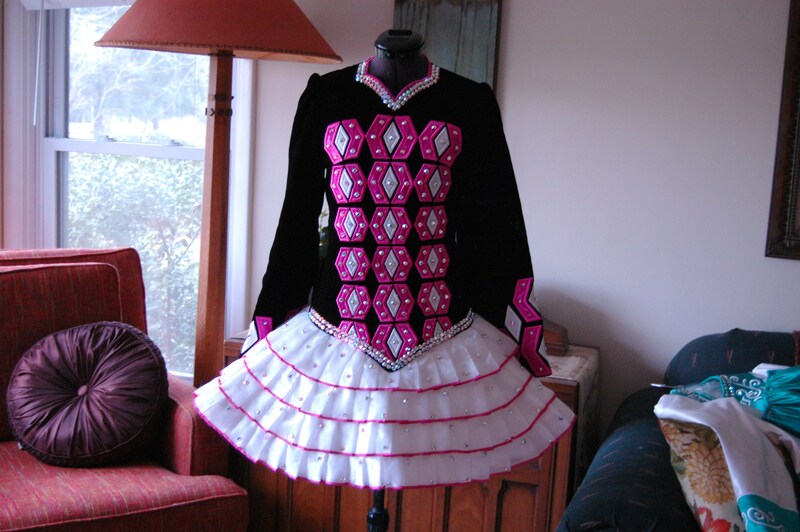 I spend my summers in Canada so I don’t make any dresses during that time, but that means a flurry of pre-Oireachtas dresses in the fall. 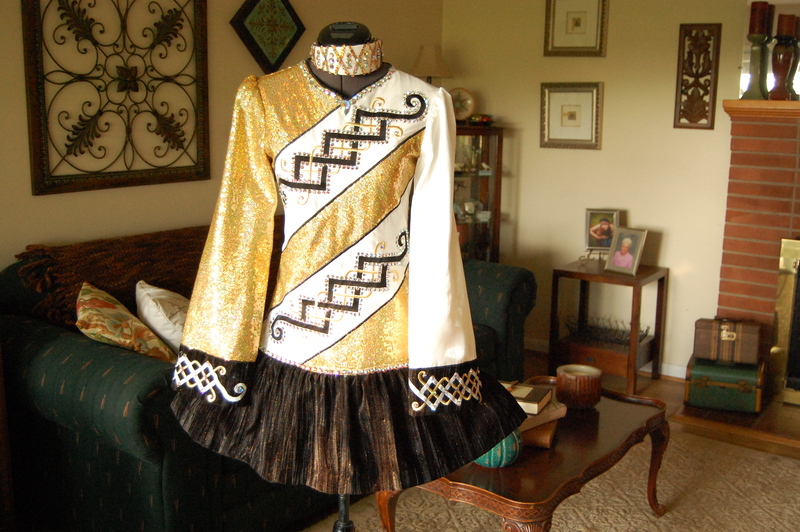 I did two full dresses this fall and 3 skirt re-dos. 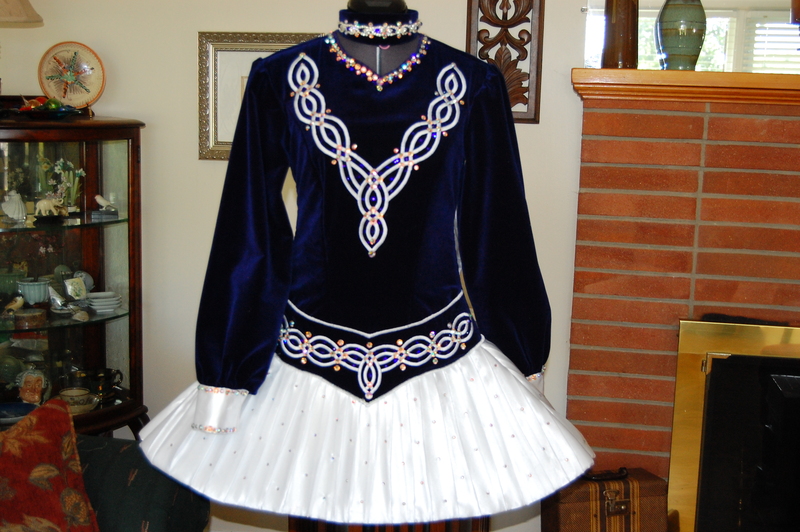 The skirt re-dos are almost as much work as a full dress but you don’t have as many bodice fitting issues. 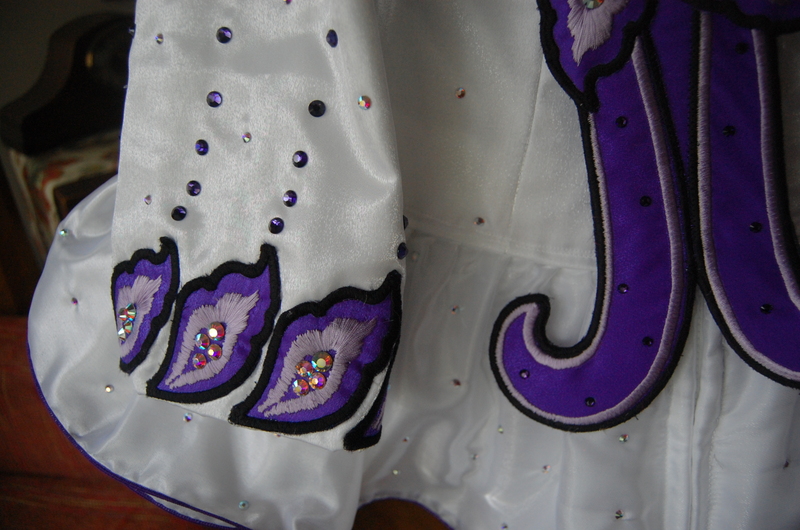 The first two pictures are of two of the skirt re-dos. 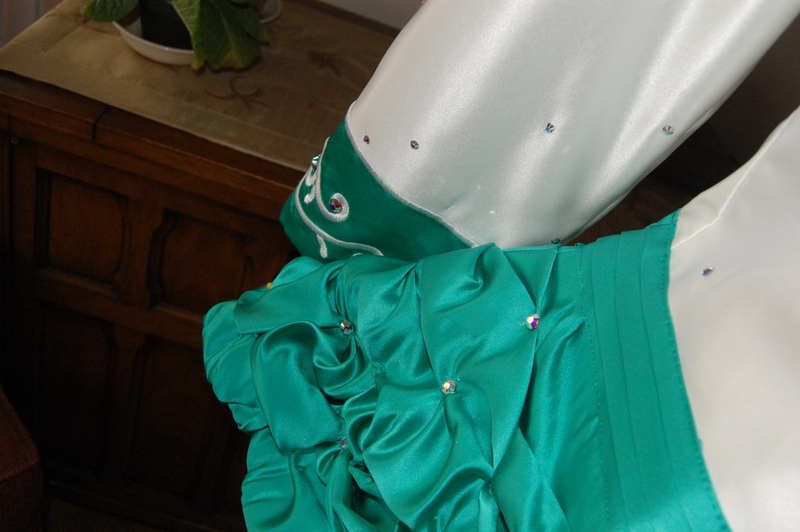 One was for a dress that I had made for a customer and the original dress was a bit too short and out of style. 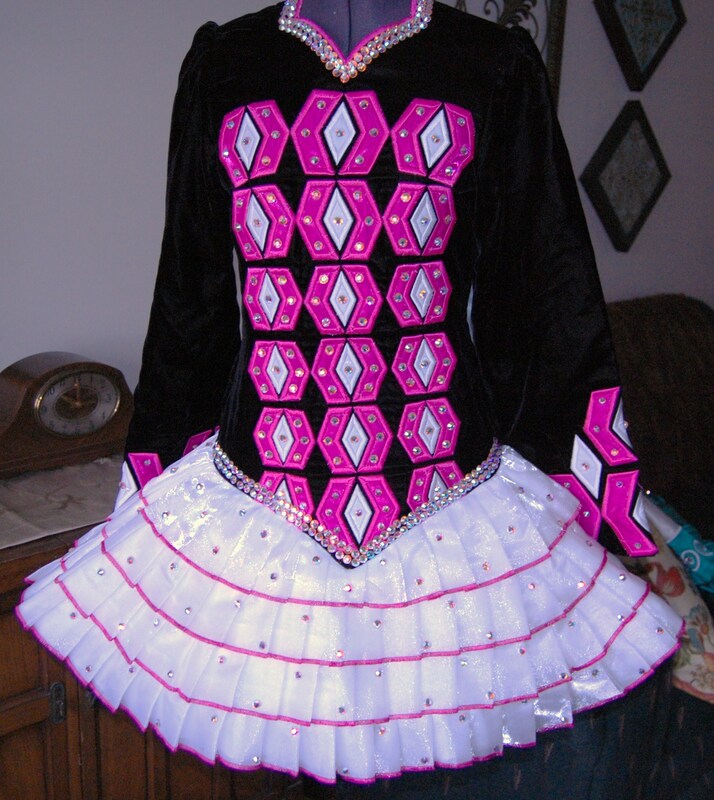 The second re-do was a little more difficult as I was not the original dressmaker. 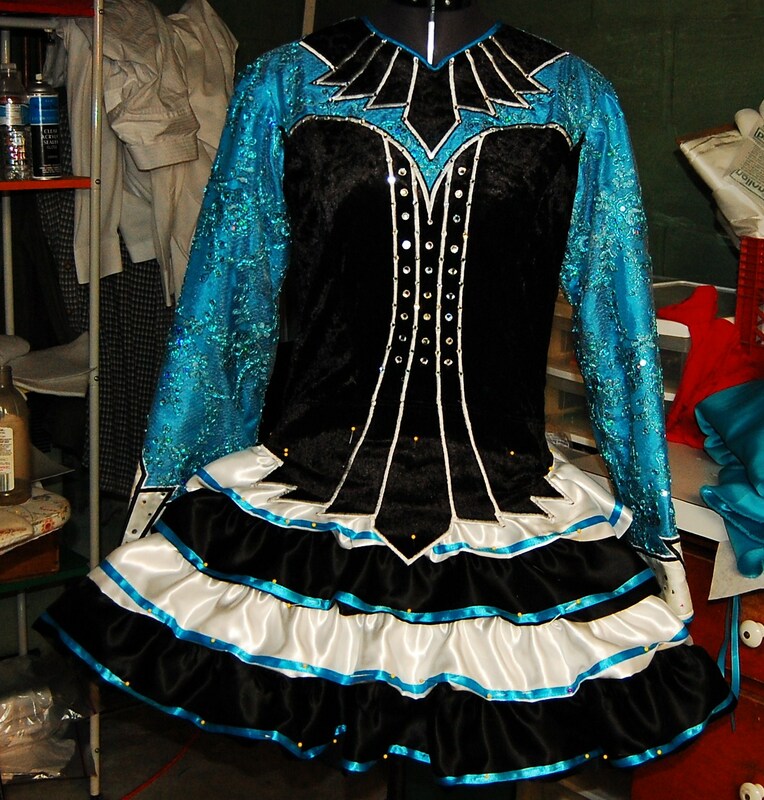 It involved adding length to the bodice in addition to making a totally new skirt. The new year is upon us and already I’ve got deadlines for 3 more dresses. 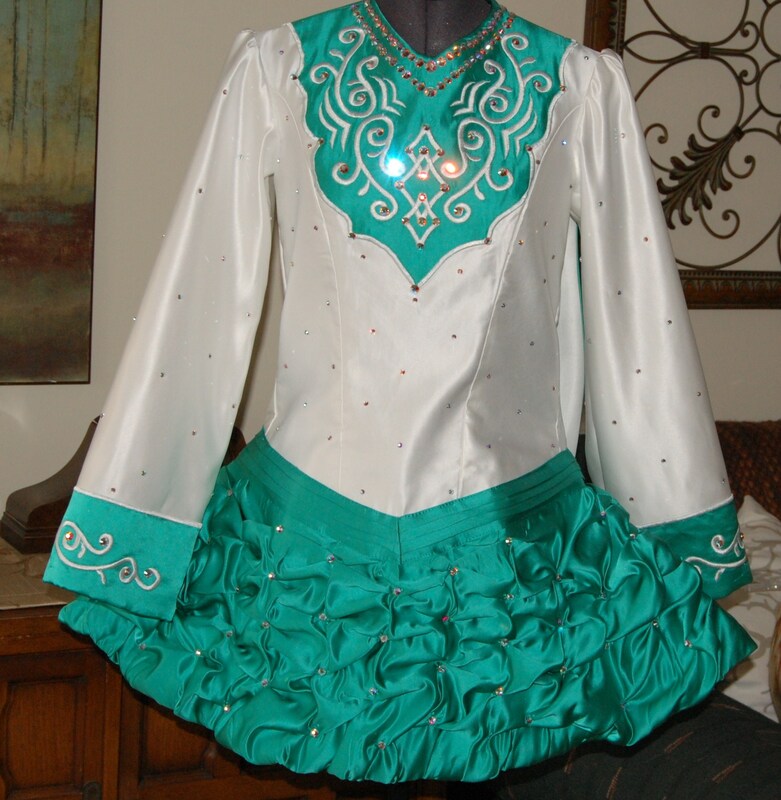 It is a blessing to be able to have work and support for this crazy business of Irish dance dressmaking. Happy New Year to all and may 2011 be a special year. 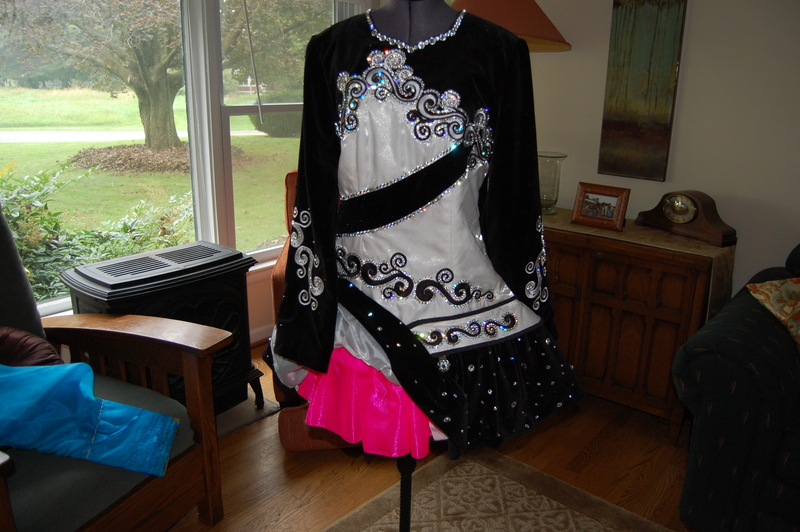 I was inspired by a dress that I saw on a dancer who won her Eastern Region Oireachtas. 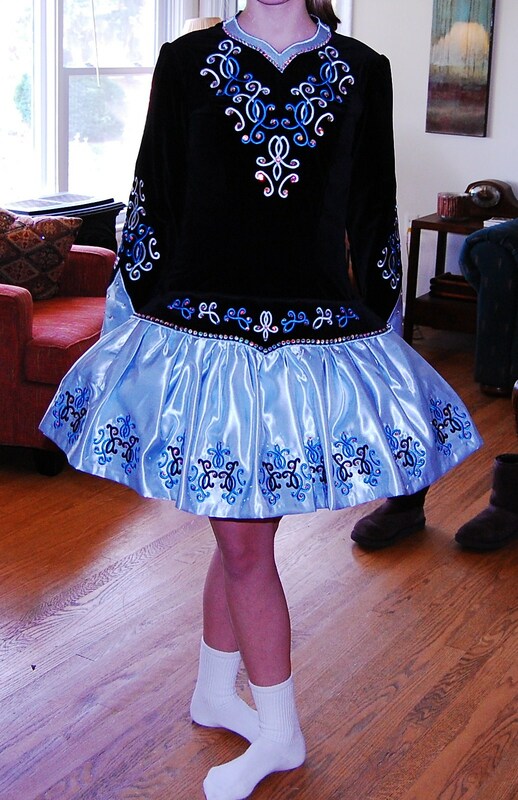 I loved the simplicity of the skirt and how it flowed. 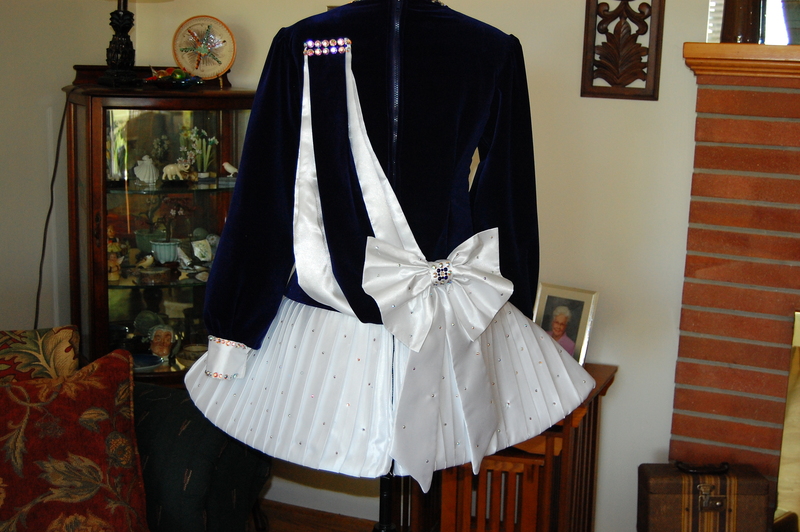 The burn-out velvet was a fabric that I had been wanting to do something with, and the cream of the skirt had been intended to be curtains. But the two of them together went well so I guess I’ll have to find something else for my curtains.